The album ROCK POOLS combines exciting new music from this year with some of our favourites from 20 years of playing music together. Two slipjigs. Teamhair or Tara is regarded as the capital of ancient Ireland. From here Gráinne, daughter of High king Cormac Mac Art, eloped with Diarmuid Ua Duibhne to avoid a promised marriage with the ageing Fionn Mac Cumhaill. Máire & Thomas with Niall Ó Callanáin bouzouki; Conor Byrne flute; Máirtín O’Connor accordion; Tommy Hayes perc. Feat. Ian Melrose low whistle, g, programming. These two reels provide a contrast of colour and energy, alternating between a slightly subdued A Minor and a lyrical A Major. “Branohm“ is a phonetic spelling of an Irish language phrase, the meaning of it is “letters observe“. Pádraig Duggan perc. ; Matthias Kießling keys. “Listen“- Midir and Éain, lovers from the Otherworld, dwell among the Gods, but dream of spending an Earth lifetime together. They know they will recognize each other by the sound of their voices in the wind. 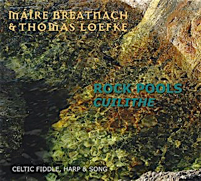 Máire & Thomas with Norland Wind feat. Kerstin Blodig voc, g; Ian Melrose voc, whistle; Noel Duggan voc; Pádraig Duggan harmonica; Matthias Kießling voc, keys. feat. Ian Melrose g, low whistle, synth; Kerstin Blodig bouzouki. 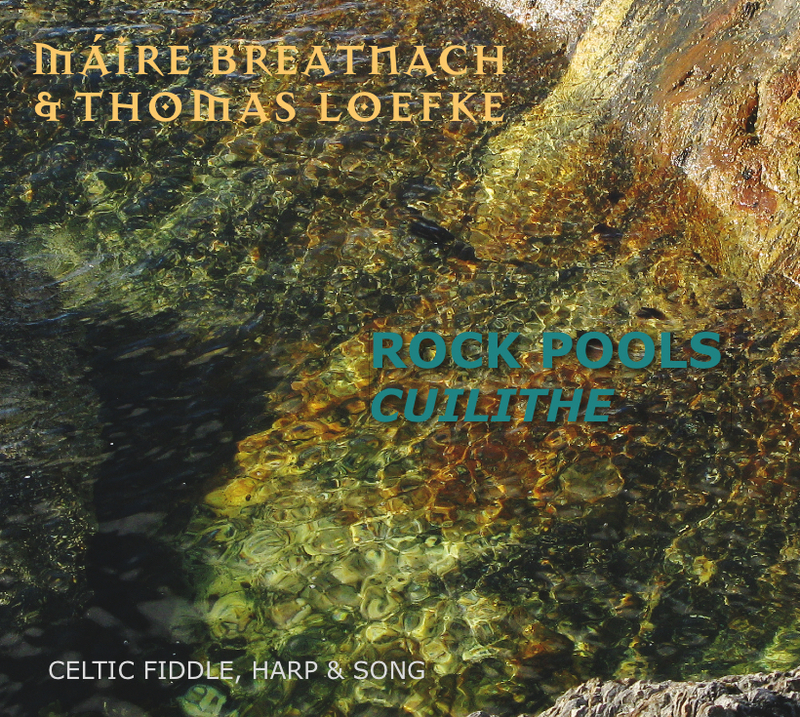 This melody came to Máire while on tour, and it seemed to wrap itself around in spiral forms. It reminded her of the circular movements of water in rock pools, ever extending outwards when new drops of water touch the surface. There is a ‘call and response’ feel to the phrases as they answer each other, much like a musical ‘cause and effect’. These lively reels were written by Máire for two of her young cousins some years back, both of whom were just beginning their own musical journeys! Mykines is the most Westerly of the Faroe Islands, a bird paradise halfway between Scotland and Iceland. Faroese fiddle player Angelika Nielsen joins for an Irish / Faroese fiddle duet – with strong guitar support from Scotland by Ian. Feat. 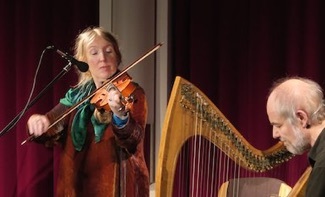 Angelika Nielsen fiddle; Ian Melrose g.
The poet vows to avenge all the wrongs done to his beloved “droimín“ or fair damsel in distress - a thinly veiled allegory, the “damsel“ in question representing Ireland. Lullaby for Gráinne and her lover Diarmuid Ua Duibhne. Máire & Thomas with Norland Wind feat. Kerstin Blodig bouzouki; Ian Melrose low whistle; Noel Duggan g; Matthias Kießling keys. Written by Ian about a friend’s sheepdog. 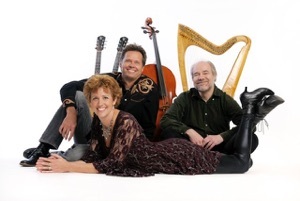 The “little devil“ (whistle) runs rings around his master and mistress (harp and fiddle) who eventually give up trying to calm him down and just join in. Feat. Ian Melrose low whistle; Kerstin Blodig g.
One of Pádraig Duggan’s favourites in the Norland Wind program. He died this summer in Dublin. We lost a great friend and fellow-musician. The Gobán Saor was the master builder in Irish lore.